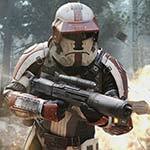 I saw that some of you have very good picture of the Havoc trooper armor. I was wondering if you could send me good pictures and information on the exact color to use. Thank you but the links to the Weave of havoc does not work. Do you mean the Jace Malcom and Havoc Squad Trooper file? Sorry for my bad English i am french Canadian ! hmm just tested it and had a friend test it. The links worked fine? I have the same problem. Sending you a PM.